If there’s one thing that almost makes me want to cry, it’s The Gush. 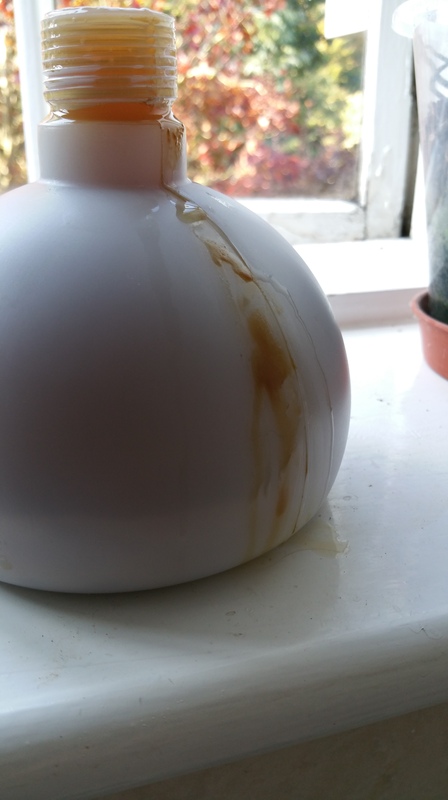 I’m talking about The Gush of beer you very occasionally get when you take the cap off of a bottle of home-brew: One minute it’s all “Ooh lovely, beer for me” and the next it’s *POP*, pretty fountain, beer all over the floor, significant thrashings from the significant other. But what causes all this unpleasantness? Search the web and you’ll find a wealth of scholarly articles, pontification and half-baked theories. You must, must, must clean your bottles out. A quick jig about with the bottle under the tap and a squirt of StarSan just won’t cut it I’m afraid. You need to get a bottle brush into them and scrub about with warm water; or, alternatively get a good soak going with something like VWP (http://www.vwpcleanersteriliser.co.uk/) I’ve used it for years on glass and it’s marvellous. You don’t have to scrub, just soak for as long as you can bear and then rinse well. Dirty bottles (even minute specks of accumulated crap) will harbour all manner of amusing wild yeasts and bacteria – all of which are capable of dealing with any residual sugars that brewers yeast can’t…making for dangerous levels of carbonation. Anyone for bottle bombs? Double-dosing loose-priming sugar is my favourite way of doing it: that’s where I get interrupted when I’m adding my 1/3rd of a teaspoon of table sugar to each sanitized bottle and end up sticking multiple loads into some. 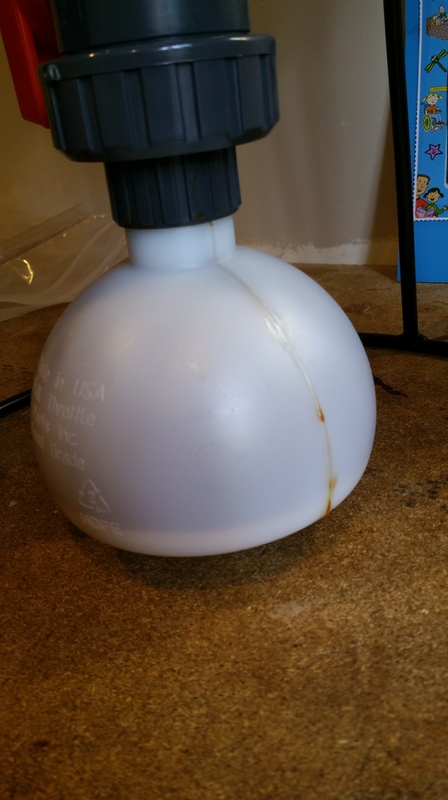 Get into the habit of priming a bottle and then loosely placing a sanitized cap on top – to show that you’ve primed it; then when you’ve got all the bottles loose-capped you can start racking into them. If you don’t stir, that sugary mixture will delight in making its way to the bottom of the bucket where it’ll squat about until it jumps into the last few bottles being filled – all of which will then have waaay more priming solution in them than they should. With the quality of the malts that we get from people like Rob and Greg ( www.themaltmiller.co.uk and www.brewuk.co.uk respectively) you’re unlikely to have grains that have been infected with Fusarium Head Blight. Fusarium is a fungus that attacks the growing barley or wheat grains and lays dormant when it’s harvested only to get going again during the steeping phase of malting. When the malt is kilned the Fusarium fungus itself is destroyed, but it does leave some of its unpleasant byproducts behind, the most important to us is deoxynivalenol – a mycotoxin that is tough enough to easily survive the boiling of the wort – and persists in the finished beer as lots of tiny bits and pieces of protein. These millions of bits and pieces of protein provide millions of nucleation sites for the CO2 in the beer. Nucleation sites are where CO2 is able to come out of solution rapidly and cause bubbles – lots of nucleation sites means lots bubbles and lots of bubbles means lots of foaming. As mentioned, Fusarium is rare but could provide a handy and knowledgeable-sounding excuse for that bottle of beer you gave to someone that’s now all over their ceiling and floor! You may be wondering what prompted all of this musing on The Gush…well, back at the end of Summer this year I had a batch of porter and a small run of Golden Ale that went off like rockets when opened. I put both of those down to bad hygiene as I was in a rush when I bottled. I now take much more care when bottling…after all, it’s the end product that people see – and you want that to be perfect. 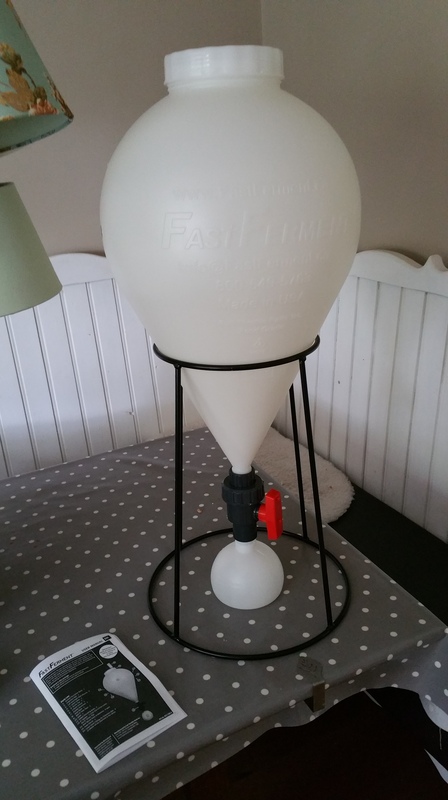 On Test: FastFerment Conical Fermenter – an affordable conical? Do you dream of conical fermenters? I didn’t ever really – thinking that they were going to be large, stainless steel monstrosities that probably cost multiple thousands. But then Greg from BrewUK asked me if I’d like to test a more economical plastic conical fermenter from the guys at FastBrewing. Now, normally getting a new fermenter is a fairly hum-drum affair: It’s usually a great big bottle or a bucket with a lid…oh and maybe a tap too, if you’re lucky. All these bits and pieces seem very well made, feel solid in the hand and the whole thing gives the impression of getting quite a lot for your money. Upon unpacking the FastFerment and loose-fitting it together, I was struck by it’s size and presence. it’s a good deal taller than a glass carboy or PVC bucket; even though it does still fit in the same footprint. The following evening I assembled the whole thing properly. In terms of putting the unit together, it’s a fairly straightforward operation. As long as you take note of and carefully follow the instructions as you go. Some of the fittings (the thermowell especially) need the assistance of a spanner to get them locked up and tight, and in doing so you really do have to be careful not to cross-thread by mistake. I ended up moistening some of the threads with a little StarSan and that seemed to help a bit. One criticism: the lid for the FastFerment is too big; I have fairly big hands but still found it difficult to screw the lid down, one-handed. I’d like to see some rubber on there or even a slightly smaller sized lid. In its current massive shiny white plastic form, it’s too difficult to get to grips with – and things get even worse when your hands are wet. Before use, try to get at least 23L of water into the fermenter before you use it for the first time. I’m willing to bet that you’ll almost certainly find you have leaks. 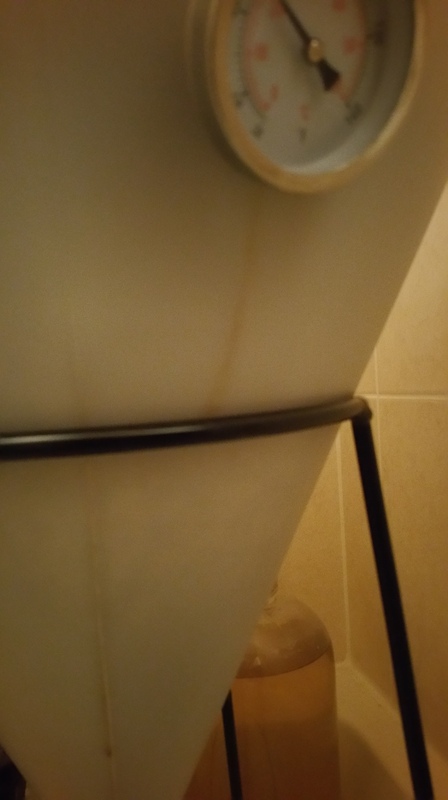 I had leaks from the thermowell, the bottom joint, where the tap joins the conical part, and also where the sediment bottle trap joins the tap unit. I had to tighten, check and re-tighten EVERYTHING. One glaring problem is, again, to do with the lid: every time you struggle with and eventually unscrew the lid, the rubber seal falls away from inside it and drops into the fermenter. This happened every time – without fail – and that’s totally unacceptable. Obviously, I appreciate that with a conical fermenter you might not need to open the top that often – but the seal falling off and dropping into the wort/beer? That’s not on. FastBrewing guys, you really need to re-design that lid. Make it more substantial, rubberized and with a retained seal…please. The tap unit screws directly onto the the bottom of the conical itself – and then under that tap unit, the threads take the retaining lock-ring of either the hose barb or the sediment bottle trap. All of these pieces are well-made and solid, but the the retaining lock-ring on both the hose barb unit and bottle trap unit is just too big and far too slippery when wet; both of really need either a hexagonal nut and accompanying spanner, or some form of rubber grip on the lock-ring. Once I was happy that I’d got everything tight and holding water I washed and drained the whole thing out and then carefully sanitized with StarSan. In doing so, I found the FastFerment to be an absolute gift in terms of weight – it’s just so easy to pick up and shake and as we all know that’s the only way to make sure that sanitizer gets into all the crevices. After a nice and easy brewing session, I filled the FastFerment up with 23L of cooled Belgian Christmas beer – noting all the while that the markings on the side of the conical unit were nice and clear, legible and easy to see. A few hours later and the ferment was in full swing, we were at high krausen and things were swinging; but as this was a darker beer I easily noticed minor leaks coming from the thermowell and also the joint where the tap unit met the conical bottom. I just tightened both up and they seemed to be holding well when I left them. The airlock was bubbling nicely, so I could only assume the whole unit was gas-tight. After four days things had died down a bit and I thought it time to take the sediment bottle trap off, in order to remove the primary sediment. But it wouldn’t budge – the locking-ring was seriously locked tight. I’m no seven stone weakling but it seemed the previously leaked wort had gummed up the lot, making it impossible to undo. I replaced the emptied and newly sanitized sediment trap and then I went away on a work trip to Las Vegas for a week; pausing only mid-flight to remember that, even though I’d replaced the bottle trap correctly, I hadn’t turned the tap back on to allow the sediment through. Blast. Upon returning a week later I noticed a good build up of fresh sediment in the bottom of the cone. I turned the tap to “on” and hoped that the sediment would just run through into the bottle trap naturally. As soon as the tap moved, huge bubbles of air from the empty sediment trap bubbled up through the wort – which was not what I really wanted or expected. Lets hope that there’s no off-taste in the finished beer from oxidation. Happily though, within a couple of hours, the sediment previously in the cone had effortlessly slid through into the bottle trap – leaving a nice clean looking cone and a very happy me. A couple of days later still, I hefted the whole lot back downstairs to the worktop in the kitchen where I planned to bottle. Even though there was a lot of sloshing about on the way down the stairs there was no danger of raising the sediment as it was safely stowed in the sediment trap with tap above turned to “off”. Now, with the Fast Ferment on the worktop and at a good working height, I managed to wrestle the sediment trap locking-ring undone, and was treated to half-a-cup full of beer all over my shoes and the floor – there’s obviously room for extra fluid to gather between the tap unit and the bottle locking-ring, so that’s something to watch out for. Having attached the hose barb and locking ring, I noticed the paltry length of hose supplied with the Fast Ferment…it’s seriously and pointlessly short for any type of sensible wort transfer. I also had no other hose of that bore that would attach to the hose barb, so just had to go with what I’d got out of the box. Undeterred, I pushed on with bottling; and found out that as well as being short, the hose was almost too wide to fit into the neck of a standard bottle; plus, due to the sheer pressure of the beer coming down this huge bore hose, the supplied plastic clamp was incapable of effectively holding the torrent of beer back – so I had to rely on the tap, instead. In the end I elected to run the lot through the supplied hose and into a glass carboy in order to bottle from there. Obviously the measly hose length couldn’t possibly reach to the bottom of the carboy, which lead to a little splashing of the beer during the transfer – which, again, I hope won’t lead to any significant oxidation damage. 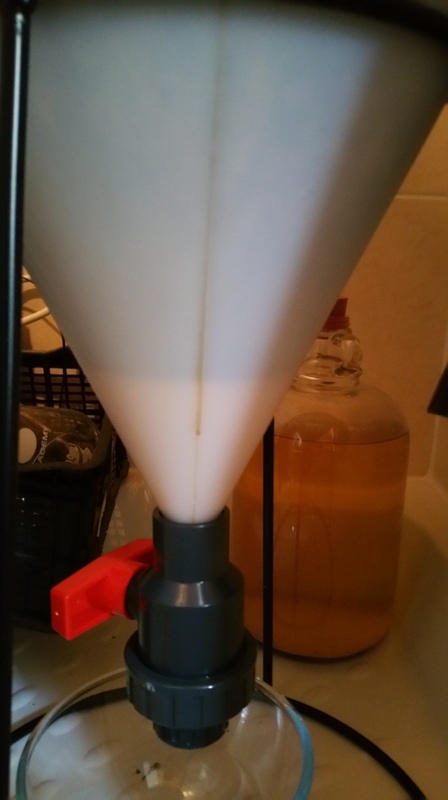 But, once I had finally finished bottling from the carboy, I went about cleaning the whole Fast Ferment unit…which was an unbridled joy: I mean; end-to-end it took less than 5 minutes! I genuinely like this product a lot – but it’s clear that you’re going to have to do a little work yourself in order to get it performing properly. Is it worth the price tag of eighty-five or so quid with the stand being an extra thirty? PS: I don’t know whether FastFerment is just a name; as, incredibly, my Belgian Dubbel Christmas beer had done with its primary fermentation in under three days! Right. So I bought a load of these bottles in Aldi last Christmas – because, quite honestly, it’s better to pick up a reasonable foreign beer for virtually nothing there, than browse through shelves of uninspiring “brown beer” in the other supermarkets. When are the mid-range supermarkets going to start stocking some interesting beers? I’d rather that they stocked less and more interesting, than more of the same “brown stuff”. 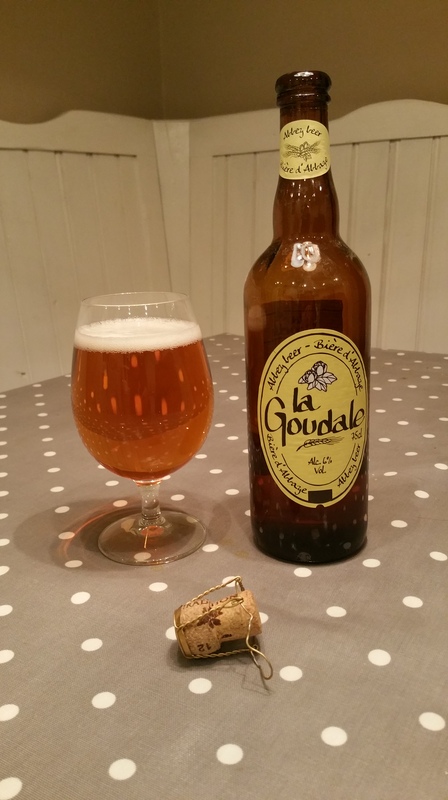 Anyway (again) La Goudale Abbey Beer arrives in a glass leaving plenty in the bottle (it’s 750ml…hooray!) and has a bright amber body with a fine running bead and a nice foamy head that fizzles away maybe a little too rapidly. The nose is vital, lively and phenolic. There’s a little orange juice (not the zest) with cereals, a bit of malty goodness and a faint ozone note on the end. It’s a hearty mouthful, with a full Belgian effect that hits the roof of your mouth as a choir hits the roof of a cathedral. Orangey malts pair with a zingy carbonation to drive a full malt sweetness home. Riding in on the back edge are more orangey malt notes and a refreshing up-in the-attic dryness that makes your mouth run with saliva – meaning you have to get on and drink more. 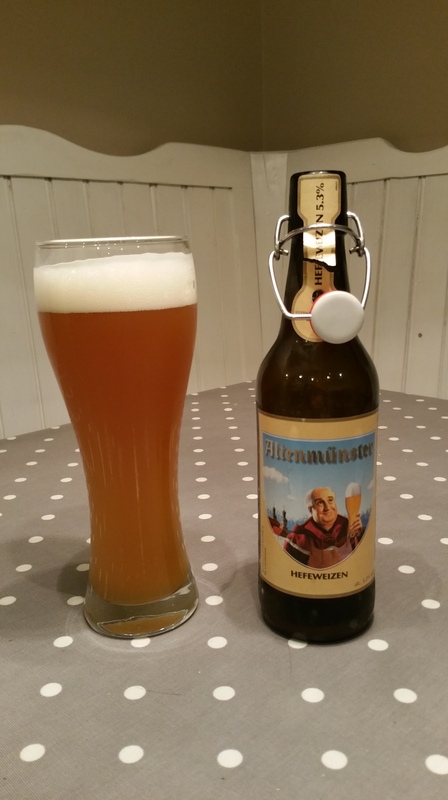 Marvellous and an absolute barn-storming bargain of a beer. If you see it, buy it on sight. It’s only just October, yet I can already feel the weight of Christmas bearing down on my very soul. Still, if there’s one good thing about it, it’s seeing their little faces light up as you bring the bottles out…and that’s the adults, rather than the kids. Don’t you think that kids get enough for Christmas as it is!? I decided to do a Belgian Dubbel because I haven’t done one before and also because the style should carry the foraged wild cherries well. 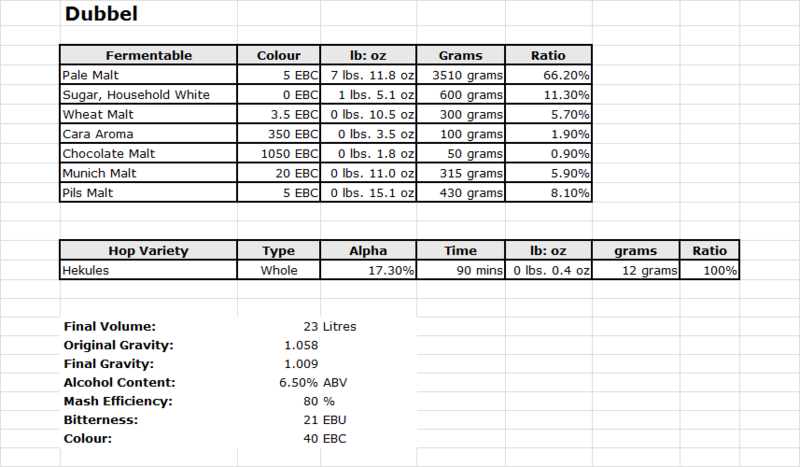 Apparently I have enough cherries in the freezer for 10L only (according to this advice: http://byo.com/hops/item/679-fruit-brew-part-2-techniques) so with a bit of rounding up and buggering around it looks like 1Kg of cherries for every 5L of beer. The remaining 13L will go into bottles as a standard Belgian Dubbel. The Dubbel style calls for maltiness without too much hop, so it seems a perfect vehicle for the fruit. My taste of this beer as it went into the fermenter was deeply malty with a nice chocolate malt edge. 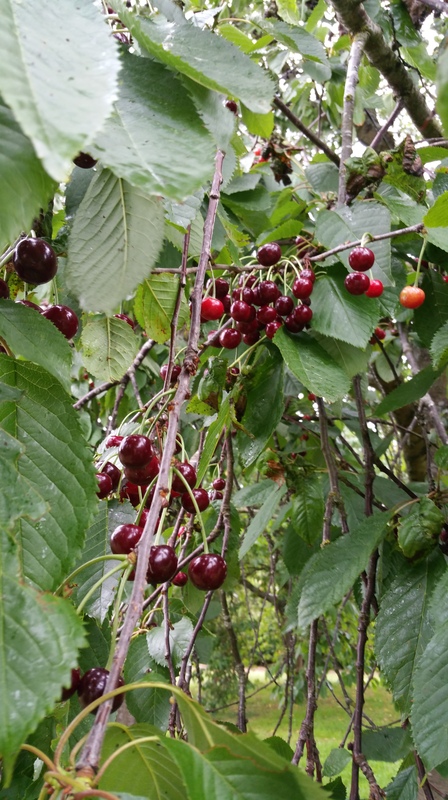 Cherries and Chocolate, how nice is that? What “stinks” to my wife is usually a good solid Belgian phenol ferment to me. Once it got going it went like a steam train. After two weeks, I’ll rack 10 litres off into a carboy with the cherries – which I’ll be sulphiting for 24 hours beforehand. Much as I love sour beer, this isn’t going to be one, and there’ll wild yeast aplenty on those cherries. I’m also going to purge the carboy with C02 as I don’t want any staling from 02 exposure. I expect I’ll leave it then until December 1st and then bottle it for Chrimbo.